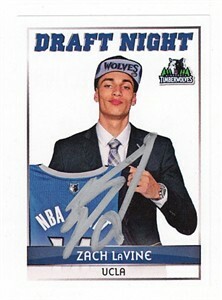 2014-15 Panini rookie sticker of 2015 NBA Slam Dunk Champion Zach LaVine autographed in silver paint. Obtained in person, with certificate of authenticity from AutographsForSale.com. ONLY ONE AVAILABLE FOR SALE.